Compared to today, computer networking in 1984 was heterogeneous, and compatibility between two systems from different vendors was unlikely. Every vendor developed their own proprietary and incompatible solution to networking, including file sharing and print sharing. Apple joined the foray with AppleTalk, a low cost and easy to operate networking system, with an announcement in 1984 and a release in 1985. Initially, AppleTalk supported the Macintosh. Soon, the Apple IIgs and the Apple Workstation Card brought AppleTalk to the Apple II line. 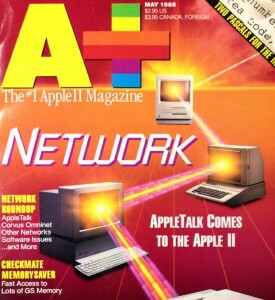 AppleTalk remained Apple’s answer to networking for about 10 years, and support for parts of AppleTalk persisted in OSX until 2009. I presented an introduction to AppleTalk and the related LocalTalk link layer at KansasFest, and you may download my presentation here.